Women are always looking for new products to find better ways to improving their skin, the healthy way, while enhancing their beauty. It’s great to find products to, not only, produce results, but to keep skin healthy and beautiful. MyTopFace found Embryolisse. This company has been around for over 60 years and still running to have new and amazing products for your skin and body. All of their products are animal-tested free. 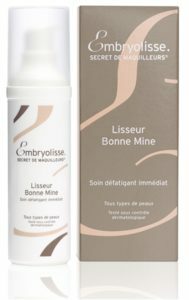 Embryolisse is the real dermo-cosmetics! They created the legendary Milk-Cream Concentrate, which sold millions worldwide. This is a great product to use as a moisturizer and primer. It has a long-lasting matte effect. 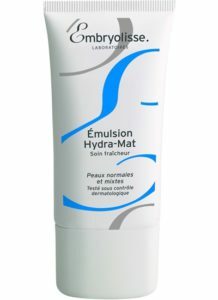 Embryolisse Hydra-Mat Emulsion is great for oily skin. The product definitely reduces the shine on your skin but removing unwanted oils. You can try to use this as a primer to prep your skin before you apply your foundation. It does not leave the foundation looking weird or cakey. This is a plus! What is this formulated without? The Hydra-Mat Emulsion does not include parabens, sulfates, and phthalates.MyTopFace thinks it’s best to use in the morning, so you have a clean fresh skin. It’s best to apply it to dry skin on the face and neck. Are you having trouble finding a product that boosts your skin and minimizes the appearance of fatigue? Embryolisse Smooth Radiant Complexion is a great gel product for all skin types 30 years plus. This product has hyaluronic acid and natural polysaccharides. These ingredients smooth out and re-generate the skin. The skin has a lifting effect after this product is applied. Smooth Radiant Complexion also tightens the skin and reduces the fine lines and make your skin looking younger. MyTopFace expert says that after it is applied, it leaves a nice glow too and it reduces the dark circles, if you have any. Smooth Radiant Complexion also has Vitamin E, which prevents any signs of premature aging and stress. MyTopFace thinks it’s best to use in the morning, so you have a clean fresh skin. It’s best to apply it to dry skin on the face and neck. MyTopFace expert believes this is a really good multi-tasker! 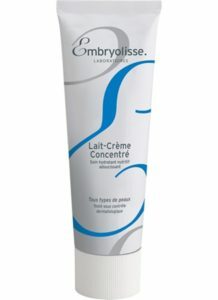 The Embryolisse Lait-Creme Concentre is another moisturizer that primes,hydrates, and also removes all of your makeup. If you have dry skin, MyTopFace expert believes this product is great to hydrate your skin. Lait-Creme Concentre is for all skin types. It’s a combination of Shea butter and emollient oils. All of these ingredients help reconstitute, rejuvenate, and repair the skin for a better and healthier-looking complexion. You don’t need to apply a lot to the skin too. Are you tired of having little to no lashes on your face? Is it hard finding something that can help eliminate this? MyTopFace found Embryolisse Lashes booster for your solution! The Lashes Booster helps with making your lashes stronger, longer, and thicker. What this amazing product can do is stimulate your lashes’ growth and transform them within 28 days. By this time, your lashes will extend, thicken, and increase its density. MyTopFace says it’s great for sensitive eyes and for people who wears contacts. This product has Biotinyl tripeptide, panthenol, arginine, castor oil, centella asiatica extract. It is also Paraben-free and fragrance-free. MyTopFace used this product in the morning before applying makeup. You can also use it in the evening after you remove your makeup too. This mini lipstick protector is great for travel when you need to moisturize your lips on-the-go! The protector soothes your lips and leave them looking great. It is made from natural ingredients including shea butter, beeswax, and coconut oils, plus Vitamin E. MyTopFace will definitely say Vitamin E will leave your lips feeling hydrated and protected. Embryolisse is a great dermo-cosmetics company that everyone should experience. It is dermatologist-recommended. It’s great to see that many makeup artists as “beauty secrets”. This is how you know that these are great products to use.